The D&P 6×10, or “Favorite,” was sold by Damon & Peets Company, a printing equipment concern of New York, between 1887 and 1894 Simple clamshell jobbers like this one–on which platen and bed were hinged below their lower edges to close on each other in clamshell fashion–were distributed by dealers, often with no name at all or with a name customized for the distributor. The name “Favorite” was used on many pieces of equipment made and/or sold by the Damon & Peets Company. Some of these machines were similar to those made by other companies. 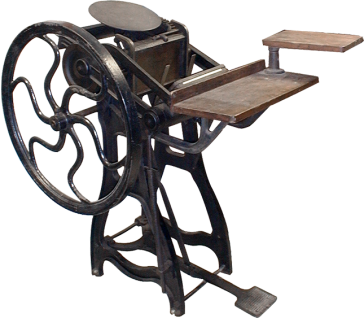 For instance, D&P’s Favorite Junior Lever Press is similar to the C&P Pilot, their Favorite Gem Lever Paper Cutter (see Paper Cutter, Gem) is similar to the Peerless paper cutter, and the Favorite Damon & Peets Proof Press is similar to the Galley Proof Press made by Chandler & Price.